Q. 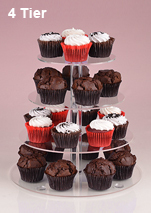 What types of cupcake stands are available? 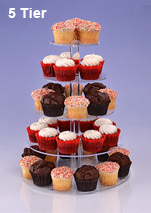 A: There are different tiers to choose from, including 3, 4, 5, & 6 tier options. 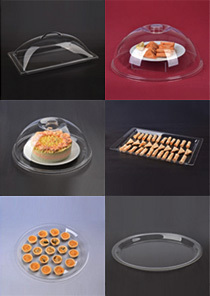 The other design different in the offerings are to choose square or round options with the tiered options. 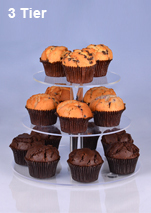 Additional styles are step risers and pedestal risers that can showcase individual pastries. Q. 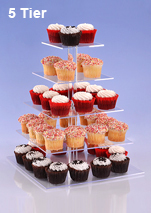 Are the cupcake stands safe for use with food? A: Absolutely. 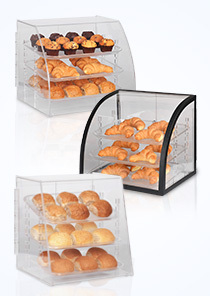 Food grade acrylic is used that is completely hygienic for use with any baked good, with items able to be placed directly onto plastic without issue. The clear acrylic is easy to clean in between uses as well. Q. Do the displays have to be assembled? 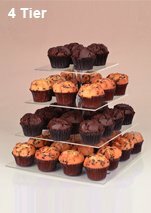 A: Yes, some models of the cupcake stands do ship flat to save on shipping and require some simple assembly, but no tools are needed! Self-screwing acrylic rods help attach the tiers. The nesting risers are shipped completely set-up and ready to go right out of the box! 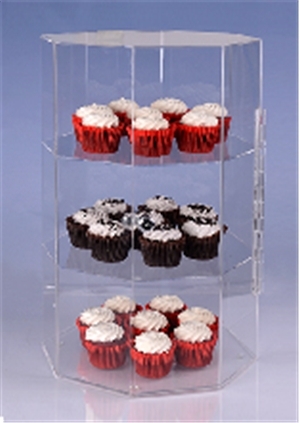 Buy a cupcake stand from Slimline Warehouse to make your event presentation really stand out! With different tier sizes and shapes to choose from, you can perfectly create the right look at weddings, corporate events, and even in the office! 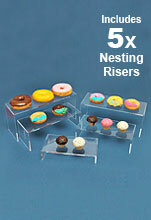 With some of the lowest prices in Australia, our acrylic cupcake stands can be found nationwide. Order by 2pm EST to receive same day shipping when in stock!